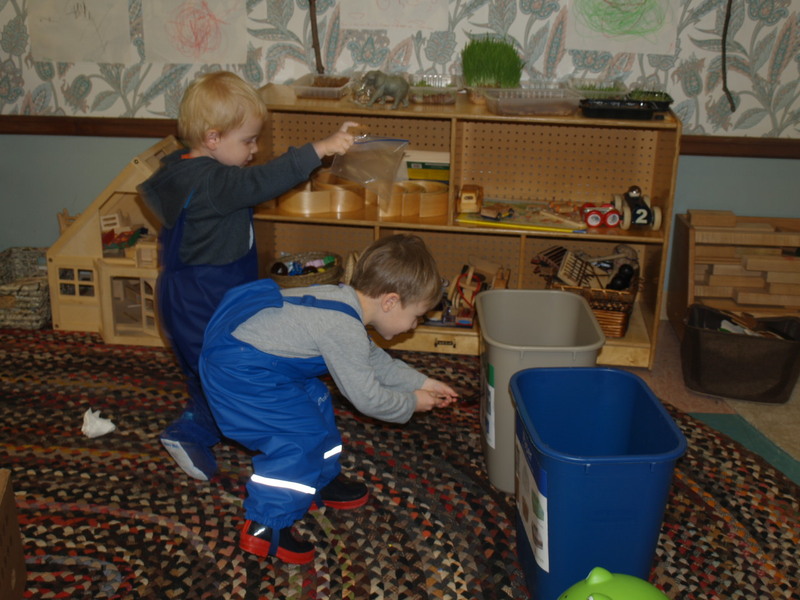 Hasting’s Little Leaf Nursery Students Learning About Recycling and they truly get it! 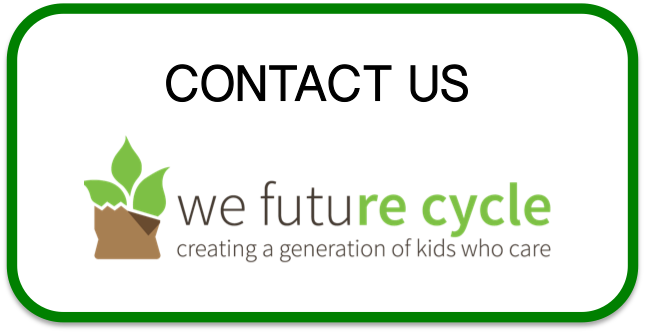 Nine adorable 3 year olds were sitting wide eyed on the carpet while helping Anna Giordano from We Future Cycle empty two reusable bags of all sorts of packaging materials onto the carpet. Carefully checking material to pictures on label, good job! They picked up empty soda cans, empty peanut butter jars, empty glass bottles, crumpled aluminum foil, empty can food cans. They checked if one can rip a pizza box, and they crinkled the soft plastic wrapper of cookies. When asked what all this stuff was, they answered according to what they had in their hand. “A bottle”, “Paper”, “box”. When you ask elementary school children the same question, the answer will invariably be “trash”. By elementary school age, children have learned already what trash is, and they have already been impregnated by the thought that all things they are done with is trash. They heard so many times already “just throw it away” that they have a clear understanding that “away” is a very convenient spot for unwanted things. These nursery school children were so excited about that a bottle can, just like Lego, be a building block for something else again. They immediately grasped the concept that if you sort things in the right bin, you can use it again. With gusto they helped to sort items into the commingled or the paper recycling bin, and they asked to do it again. They learned to identify between hard and soft plastic and they learned that aluminum foil is metal. They can pick out paper and cardboard, and they learned with sadness that little plastic baggies are not recyclable again, but really trash. Theresa McCaffrey, owner of Little Leaf Nursery school is very focused on teaching her students about nature. 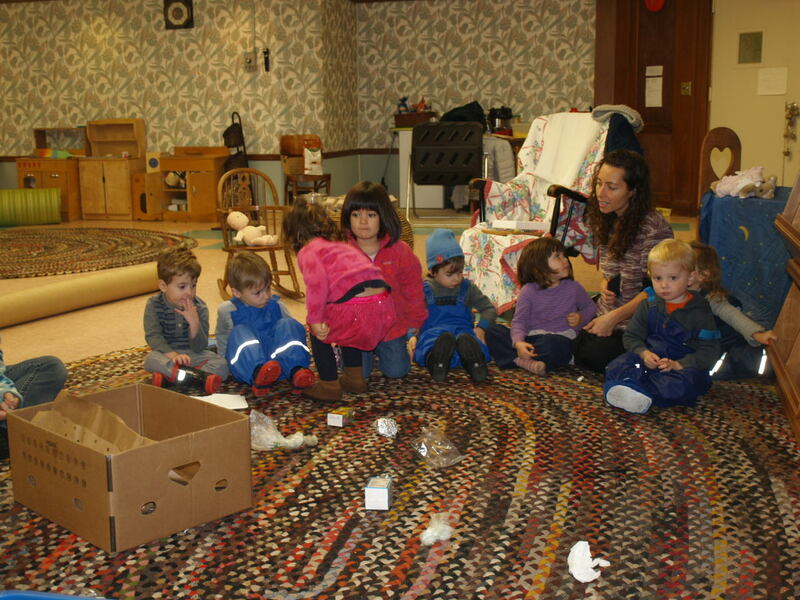 The multi-age nursery school is located within Andrus-on-Hudson, a senior residential community, and it’s 25 acres are the children’s living classroom. Little Leaf at Andrus On Hudson is in Hastings 185 Old Broadway, Hastings-On-Hudson, NY 10706. Gorgeous. There is a garden, a mud kitchen for the kids, and all kinds of outdoor activities. Daily routine is a nature walk, come rain or shine and these kids are suited up in rain gear and are running around with huge smiles on their tiny faces. 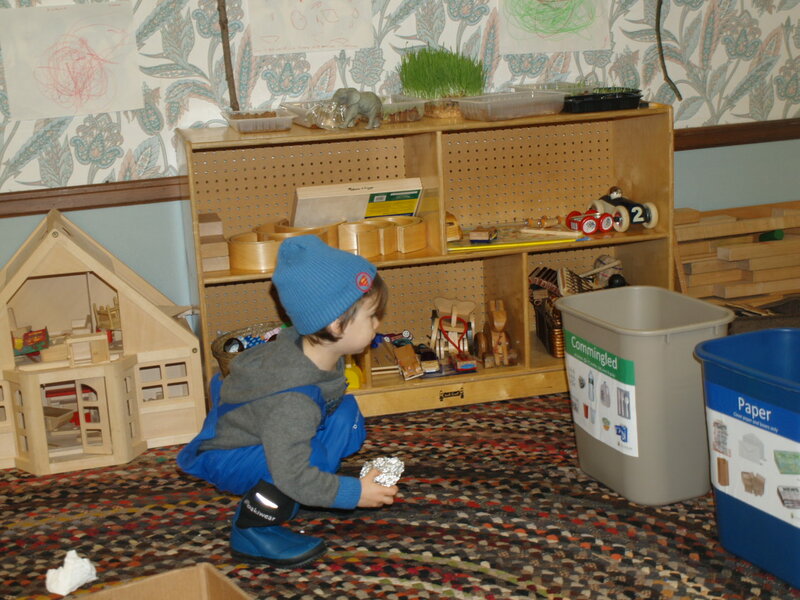 They do activities with self collected acorns, they have communal snack on washable plates and bowls, all organic, non processed foods, heavy on fresh fruits and vegetables. You will find no sugary juice boxes or processed lunchables here. A fabulous place! 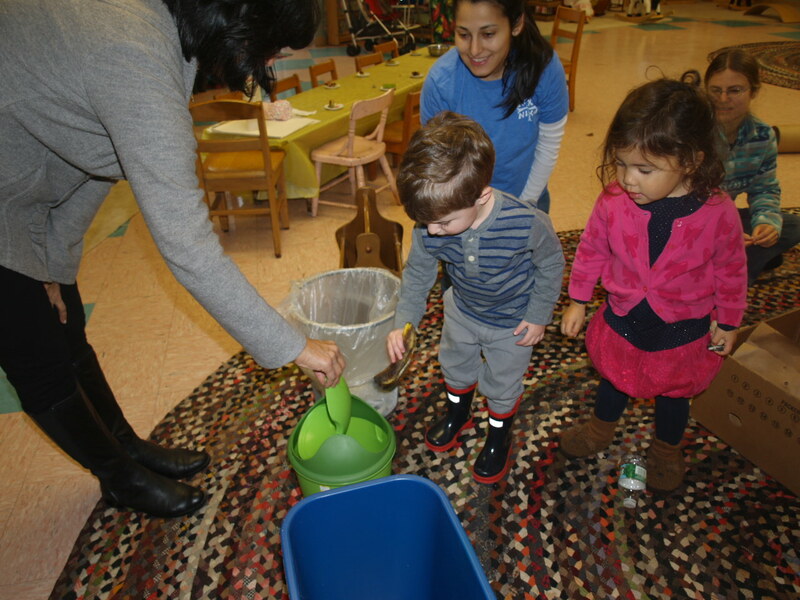 And now, the students are also learning about the cycle of food waste into compost. 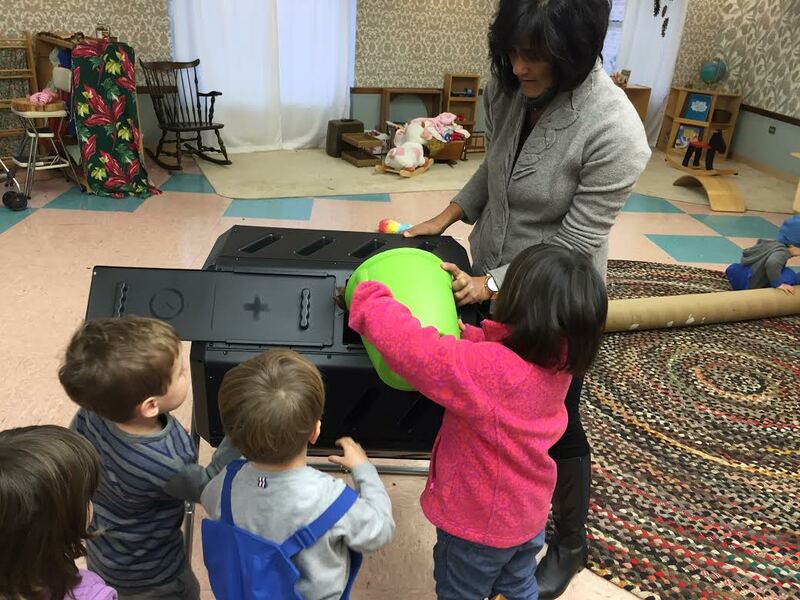 We Future Cycle set up a compost tumbler and the students are now sorting their clementine peel into a cute froggie shaped bin and are proudly taking turns to bring the bin to the composter, mixing in the browns with the greens, and then tumble. Under the guidance of Ms Caffrey and her two amazing assistants, Little Leaf students are already making a difference in this world. Way to go!